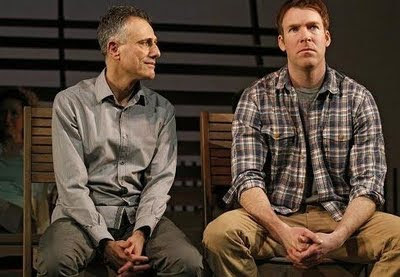 For David Greenspan and Brian Hutchison, love is in the air in "Go Back To Where You Are." Photos by Joan Marcus. This adage is proved wrong by “Go Back to Where You Are,” where expecting the worst does not set the bar low enough. It is playing at Playwrights Horizons’ Peter Jay Sharp Theater through 1 May. Passalus (David Greenspan, who also authored the play) is released from an eternity in hell to do an errand for God (Tim Hopper in a dual role). His mission: to repair to a houseparty on Long Island to help Caroline (an unseen character) liberate herself, though from what exactly is unclear. If Passalus completes his mission as asked, only taking care of Caroline’s predicament, he will be granted the utter oblivion he has requested. He fails by meddling in the lives of others he encounters, including falling in love with Bernard (Brian Hutchison), a playwright. Lisa Banes and David Greenspan are shape-shifters in "Go Back to Where You Are." It is a pleasure to watch LB oozing insincerity and unctuous backbiting phoniness as she welcomes her guests. In fact, the players pluckily attempt to put over the drivel that is “Go Back to Where You Are,” and they are all good. Still, it may be the longest 68 minutes you’ll ever spend in a theater.